4) Type set devmgr_show_nonpresent_devices=1 and press Enter. 6) When Device Manager loads click on View and select Show hidden devices. 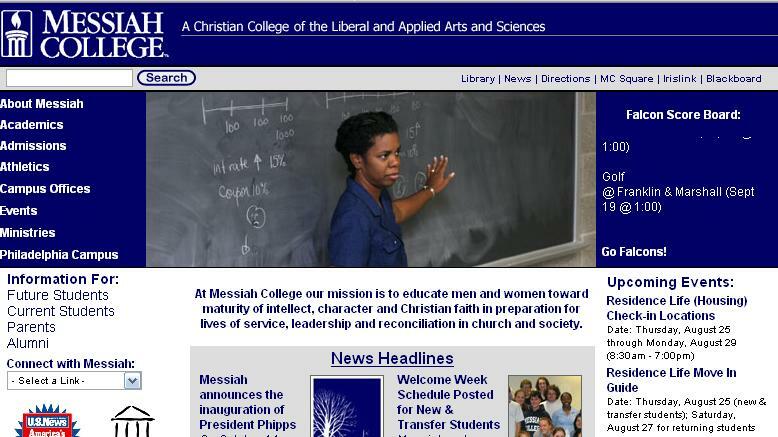 Is it just me or does the new Messiah College home page design look pretty lame? The previous layout had more distinct sections for the various stakeholders of the university – now everything seems all over the place with no clear sense of organization or layout. I emailed the college webmaster, Justin Sentz, and apparently the reaction thus far has been overwhelmingly positive. Perhaps, it’s just me, but the site doesn’t capture my attention as there’s so much action going on all over the page. Obviously, I’m the last person who should be pointing a finger as I’ve still got to get cranking away at the new Dozing Dogs release. I’ve only been putting off work on my�site for the last year. Looking for a registration code for the Opera browser to avoid having to put up with the advertisements that run in the typical free version? Simply visit the Opera Community Party and request a registration code and enjoy ad free Opera usage. At work today I happened to be introduced to my first laptop actually setup with the Dvorak keyboard layout. Never heard of it? How about a visual reminder? Look familiar? Apparently, according to Gillian Grassie, the client I was helping, the keyboard is setup and adapted to the English language. As a result, most users who end up switching from ‘QWERTY’ style keyboards enjoy increases in typing speed, higher accuracy of typed words and most of all greater comfort because of the placement and balance of letters. Either way because of the way my work environment is structured I doubt if I’d be able to switch to this keyboard layout anytime soon, but nevertheless at least I have some of Gillian’s music to listen to while contemplating the move – music that apparently blends folk, pop, jazz, rock, latin and Celtic influences under a sweet but intense soprano. The words move-in weekend echo different sentiments for most people. The pain of broken backs for the movers, freedom from rules and restrictions for students, and for some the thought of more than 5,000 students returning from a Summer vacation eager to connect to the Internet. Today, I fall in the last category, preparing with colleagues to help keep a network secure and still ensure that these returning students are able to connect to the Internet with the least amount of hassle. As I’ve blogged before, Temple University has continued to gain an increasing amount of recognition for the various initiatives that have been coming from the Computer Services department. The 2005 CIO 100 Award recognized the department for its boldness to assume significant risk for the sake of great reward. From the outside, it’s hard to picture how a public research university could be ranked or compared to other Fortune 500 company initiatives. However, picture for example a typical student computer. Plagued with viruses, spyware, file sharing programs and the host of unknowns. Multiply this typical computer with 5,000 possible similar occurrences and the picture immediately becomes a nightmare. How do you prepare for this onslaught on your corporate network? In past years and in my previous college, students were allowed to connect to the Internet and if found violating a network policy were then taken off the network. This reactive approach worked really well for the small class size. However, Temple University has more than 35,000 students, staff, administration and faculty members who need access to network resources. Disruption of service is out of question and so for the Fall 2005 semester, the university decided that the best way to reduce the impact of this possible nightmare on the network was with a very proactive approach. An approach that extends the vision of security on the network to the workstation level. At this level a computer cannot connect to the network without passing certain basic rules that determine that the computer is safe to proceed with a connection to the Internet. For example, ensuring that a student’s computer has an antivirus program, a firewall and the typical operating system updates immediately raise the level of protection on the computer. Once this set of rules is centrally controlled and managed the security level is further raised allowing an administrator to effectively follow a best practice to maintain security on the network. This is boldness and as the CIO 100 Award aptly describes, boldness is the willingness to assume significant risk for the sake of great reward. So as we mentally and physically prepare for move-in weekend I’m hoping that the resulting sentiment is one of accomplishment.